Danville Town Hall is located at 210 Main Street, Danville, NH 03819; phone: 603-382-8253. Photo: Elm Farm, ca. 1800, 599 Main Street, Danville, NH. Listed on the National Register of Historic Places in 1988. Photographed by User:Magicpiano (own work), 2013, [cc-by-3.0 (creativecommons.org/licenses/by/3.0)], via Wikimedia Commons, accessed May, 2014. Danville (formerly known as the Hawke township) contains roughly 7,000 acres. The hilly terrain is strewn with the huge rocks and boulders left by the retreating glaciers that once covered New Hampshire. It is sometimes affected by an active earthquake area which lies along the seacoast area and a wide strip several miles inland from Portsmouth to Boston. The weather is typical of New England, with occurrences of quickly-shifting temperatures and unseasonable snows or frosts. The soil is uneven with deposits of clay and ledge, as well as land suitable for farming. The Squamscot River passes over the northwest corner of the town. Danville has three ponds of various sizes, numerous small streams and brooks and many wetland areas. The original forests consisted of hardwood, conifers and huge stands of giant pines. Prior to settlement, the area was rich in fish, game and timber. There was an abundance of wild berries, wild mushrooms, grapes and nut trees. Rivers and ponds teamed with fish. Deer, turkeys, heath hens, pigeons, teal and swans and other waterfowl were plentiful. It is generally believed that the first Americans (Indians) were of the monolithic or Stone Age. Evidence of stone weapons and hunting implements have been found within the town limits. Also found within the town is a primitive stone cavern in the ground known as the "Beehive Hut." The construction date of this stone structure has yet to be determined, but it is said to be similar to early stone structures found in Salem, New Hampshire. It is known that some 2000 years ago, the Abenaki clan of the Algonquin Indian tribe lived in New Hampshire. Their presence in the area was documented when two primitive stone tools from the Archaic Age were found on Danville property. The tools are estimated by the Peabody Museum of Harvard University to date approximately 1000-2000 B.C. Before settling of New England by the whites, thousands of Indians perished in tremendous warfare and a pestilence along the entire northeast coast. As a result, few native Indian tribes remained when settlers arrived in this area. Yet, large numbers of Indians would come to the area now known as New Hampshire to hunt in the summer. The area which would become known as the Hawke township was situated between two known Indian trails. The Pentucket Trail led from Haverhill (Pentucket), Massachusetts to Great Pond (Massapaug) in Kingston, New Hampshire. The Massabesic Trail led from Merrimacport in Massachusetts, through Old County Road in Plaistow, to Phillips Pond in Sandown. Danville's geographic location in relation to these two trails spared early settlers from all but isolated Indian attacks. Prior to 1690, Hawke was part of Hampton, as were all of the surrounding towns, and was included in the original Massachusetts Bay Colony grant given to New Hampshire. In 1694 the parish of Kingstown was incorporated and it included Hawke as the westerly part of the parish. There were some families that lived in this region as early as the Mid 1600's but the first recorded settlements were about 1735. The meeting house in Kingstown was quite a distance for the residents of the westerly part of the parish to travel. Travel through this part of town was on roads which were little more than foot paths or bridleways that led from farm to farm. The residents of this westerly part of town built their own meeting house (the Old Meeting House) in 1755 and petitioned the Governor on January 2, 1760 to be set apart and to form their own Parish. The petition was granted on February 22, 1760 and Hawke was incorporated. They sold pews in the Old Meeting House on June 23, 1760. The farms in Hawke at this time were mostly self-sufficient with the main industries being agriculture and livestock. There were also mills for processing fruit and grains. In 1775 as the War for Independence was beginning, the New Hampshire census lists the population of Hawke as 504. Records also show that Hawke had 137 eligible residents who participated in the Revolutionary War. As the Revolution ended farming continued to be the primary livelihood, although the industrial age was slowly moving into rural Hawke. By 1828-29 there were eight mills for various purposes known to exist. Travel was becoming more important, and from 1790 well into the mid 19th century the town allocated many sums of money for road building and repair. In 1800 it was the practice for a road builder (District Highway Surveyor...the predecessor to our road agents of today) to be granted authority to tax those the road would benefit. The tax was based on the amount of land owned as well as personal wealth. A person was allowed to work off the tax by providing physical labor or oxen and equipment to help with the road construction. In 1833 a warrant provided for "a new highway in the south part of town" that caused some controversy among the townsfolk, but was ultimately completed in 1835. The Tuckertown small pox epidemic, one of the most memorable and saddest of Hawke's historical legends, occurred in the winter of 1781-82. The Reverend John Page willingly went to the "pest house" to care for those afflicted, only to eventually succumb himself. Several of the Hawke landmarks, still maintained and enjoyed by the people of Danville, originated during this period. The predecessor of the "Old Red School House" (613 Main St.) was first built in 1789. It was destroyed by fire in 1834, and replaced with the current structure a year later. The "Old Meeting House Cemetery" (468 Main Street) is believed to have received its first permanent resident in 1820. The first official burying at the "Center Cemetery" was in 1827, when Enos Colby, a beneficent Hawker who donated his services as a stone mason to wall the cemetery, died the day he completed the job. The last person believed to have been buried in "Ye Old Cemetery" was placed there in 1834. A further sale of pews in the gallery of the "Old Meeting House" was recorded in 1798. There were later sales as well, as Nathaniel Webster is believed to have purchased his pew in 1820, the year before his marriage to Sarah Lovering. In 1829 the town appropriated funds to buy a hearse and construct a building to house it. This became known as the "Hearse House", which was moved to its present location at the southwestern corner on the perimeter of the Center Cemetery in the 1890's. The "Town Pound" (371 Main St.) was authorized by warrant in 1802 and built shortly thereafter. 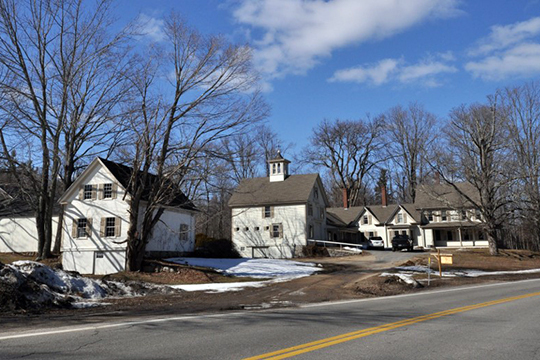 From 1820-1860 Danville typified rural New England life. Most residents followed agricultural pursuits, although the keeping of orchards and animals began to decline. The impact of the Industrial Revolution was to make its mark especially in the area of home industries and small businesses. Sawmills, cooperages, blacksmithing and small home shoe shops provided extra income for farmers of Hawke/Danville. Wagons loaded with casks and barrels left town for port cities of Newburyport, Gloucester, and Salem while town cordwainers complimented the shoe industry of Haverhill by sewing and lining the shoes that were eventually trimmed, dressed and packed in the nearby city. Religion, which had been a prime factor in the establishment of Hawke, continued to influence the people. The only two churches in town were constructed in this time period. The Baptist Church was first organized as the Church of Christ in 1820. In 1832 the Freewill Baptist Society was organized, and Deacon Thomas Colby was authorized to build a church on the corner of Main Street and Kingston Road that was later moved to its present location. In 1850 the Union Religious Society built the only other church, other than the Meeting house, on Beach Plain Road. Perhaps the single most significant event occurred at the 1836 Town Meeting where the original town name of Hawke (named for the British Admiral Edward Hawke) was changed to Danville. No definitive explanation has been discovered for the reason for the change or explanation for originally considering the name "China." Town of Danville NH, Planning Board, Master Plan, 2009: Chapter 7, Historic Resources, December, 2010, www.townofdanville.org, accessed June, 2011.